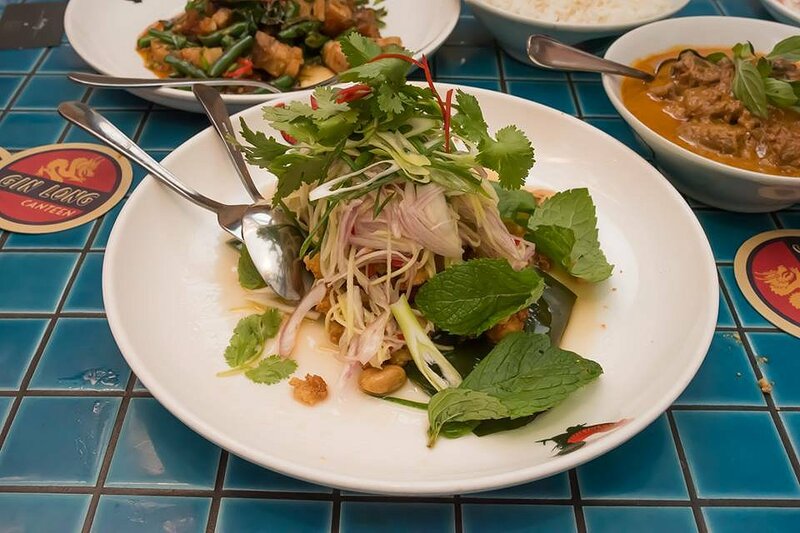 Wednesday night Adelaide Food Central was invited to an Insider Program Dinner hosted by UberEats and Gin Long Canteen. Once a month UberEats get together at one of their clients restaurants, and put on a spread of food for their insiders. We started off the evening with a demonstration on how to cook an extremy flavoursome Thai Beef Salad. It was great to see him in action and to be shown how to make one of his menu items. We were then presented with an array of entrees, mains and desserts. 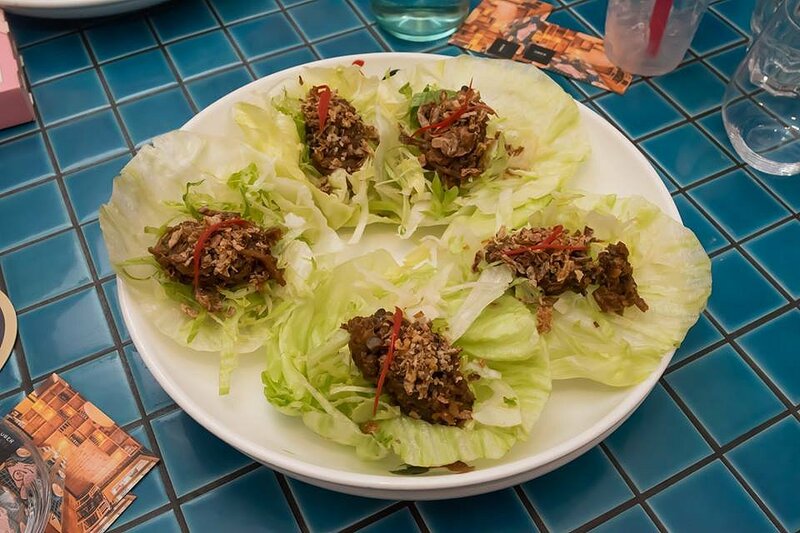 Larb Gai – chicken mince, toasted rice, mint, and chilli. This dish was definitely the highlight entrée of the night. The beautiful flavours that were infused through the chicken mince were to die for. The mince was then nestled in a lettuce cup, which helped to add an additional crunch. The herbs of mint and chilli gave the dish that extra burst of flavour. Prawn Toast – lime leaves, lime mayo. This dish is not the kind of toast that you have for your Sunday morning breakfast. The toast is almost like a deep fried corn fritter with lots of crunch and flavour. The combination of prawn and corn worked well together, especially with the sweet flavours that the corn provided. 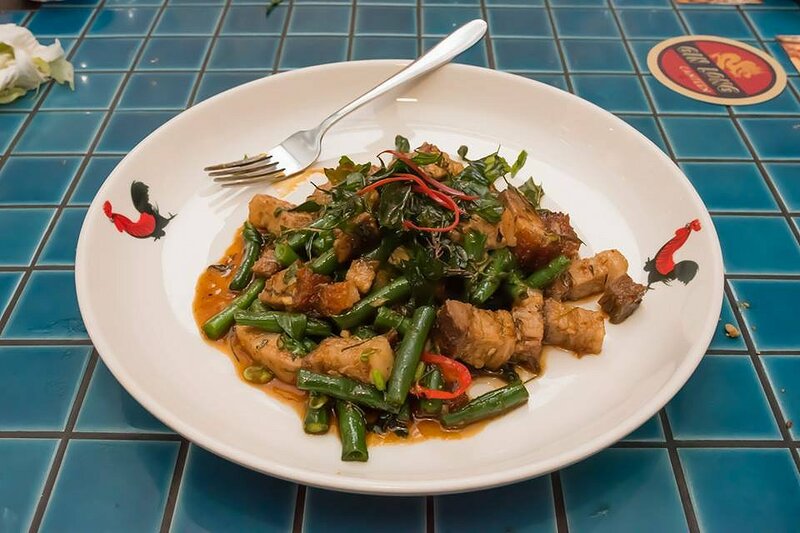 Stir Fried Roast Pork – green beans, dry curry paste, basil, and chilli. Pork belly is one of my all time favourites, when ordering at an Asian restaurant. The delicious crunch and juicy pork, paired with the flavoursome beans made a delicious dish. 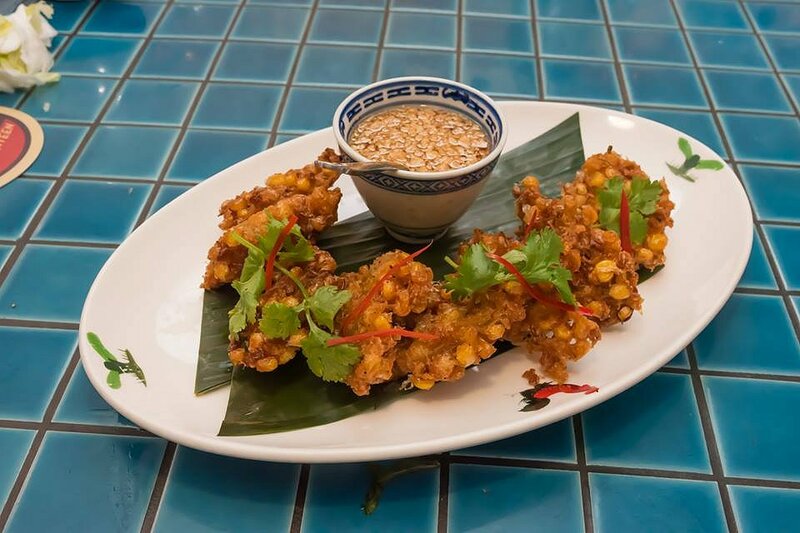 Gin Long know how to use all their herbs and spices to perfect the flavour and spice in each of their dishes. Dragon Beef Curry – red curry, Thai eggplant, lime leaves. I think we can all agree with me when I say that this was the highlight dish of the night. 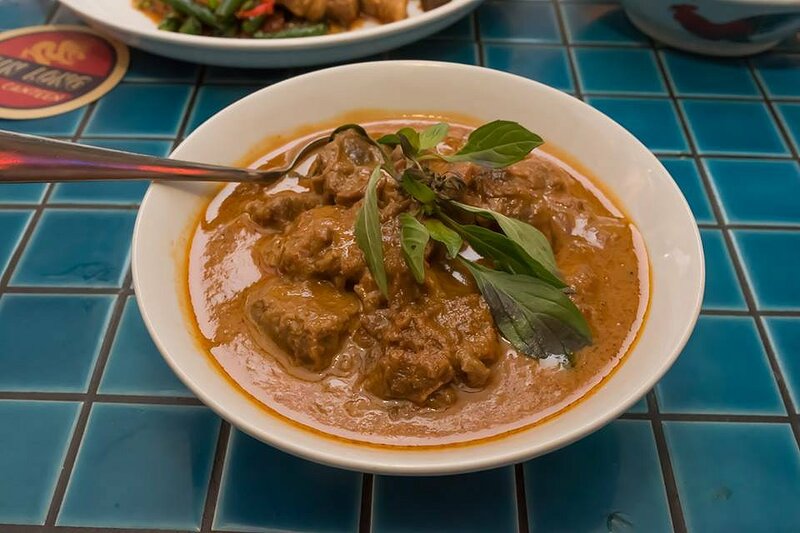 The beef used in this curry was perfectly cooked and tender, and coated with a sensational red curry sauce. The eggplant and lime leaves added a fresh element along with an extra burst of flavour. 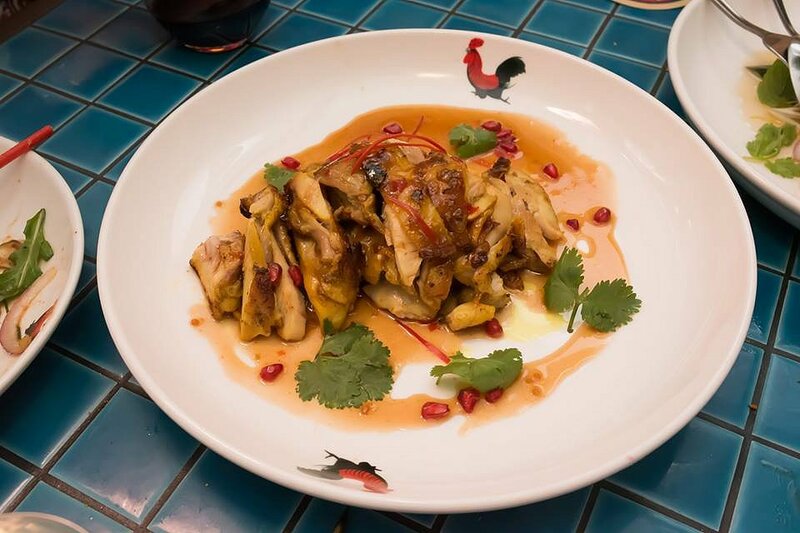 Pomegranate Chicken – chargrilled chicken, sweet tamarind. I would never usually order a chicken dish at a restaurant, as I tend to find it quite boring. This dish on the other hand is something I would order over again. The chicken was chargrilled and coated with a sweet tamarind sauce, full of flavour. I loved how the pomegranate was used to give the dish extra sweetness. Tofu Fritters on a Green Mango Salad. I really liked the idea of this salad, it is something quite unique that you don’t find regularly on a menu. The tofu fritters were crispy and helped to give the dish texture and an element of crunch. I loved the fresh elements of the salad and the sweet flavours of the mango. 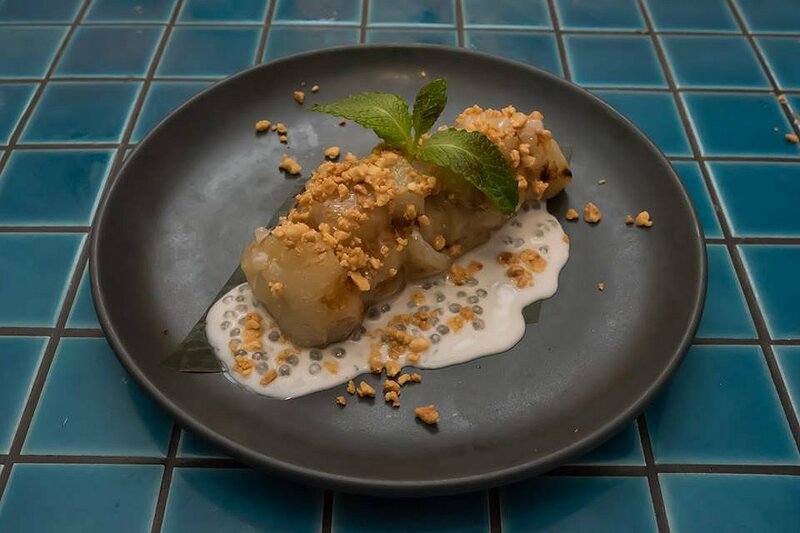 Sticky Banana Roll – chargrilled with banana leaf, coconut milk and peanuts. Ah this dessert was the perfect end to our amazing feast. The combination of the sticky rice, coconut milk and the sweet banana worked perfectly together. The peanuts helped to give the dish an extra crunch element. We would love to thank all the staff at UberEats for inviting us along to this event. Also a special thanks to the staff at Gin Long Canteen for showcasing to us their beautiful range of dishes.